Do you have a picky eater? The kind that at holiday gatherings won’t eat anything except maybe a roll? Our family is full of those kids, and my brother and I were no different. That was until my mother started bringing applesauce salad to our family functions. Getting picky eaters to eat at family events can be tough. Trust me, I know the pain. Mine is not only picky, but I had to add a limited diet to his pickiness because of his egg allergy. Getting him to eat wasn’t easy, and he hasn’t quite gotten past it yet. When holiday food is planned it isn’t always with young kids, that have picky palates, in mind. Not that I think we need to serve chicken nuggets for family meals, but it is nice when there are a few picky eater items available. Applesauce Salad is a recipe that my mother found many years ago when my brother and I were little. I doubt she even remembers where she found it. 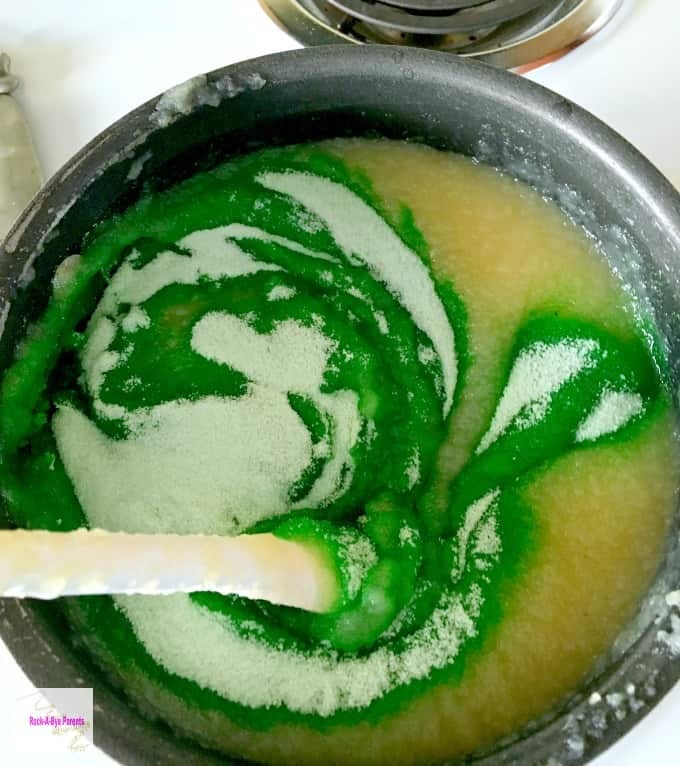 As kids we always referred to it as Green Jello, and that is what the entire family actually calls it. This seems to be one of those recipes that you either love or hate. For the most part it’s a hit with our family, but not everyone cares for it. Although to date there has only been one kid in the family that wouldn’t eat it. To be honest though she would rather of had escargot (I’m not kidding) so her food palate was a bit different. My brother and I have always loved it though, and Nick inhales it. What I’ve found over the years is that the look of it causes people to be unsure if they want to eat it. A side salad with colored applesauce can truly make people pause. It is really yummy though, and I have several family members that are quick to jump in and tell others that they simply have to try it! One of the things I love about this recipe is that it’s so easy to make. It was one of the first true recipes that I made for a potluck after I moved out on my own. It also doesn’t take much time to make, but you do need to make sure you make it in advance because the Jell-O needs time to set. The first thing you need to do is pour the entire jar of applesauce into a large sauce pan and heat it until boiling. Just a word of advice. Once you hit the boiling point the applesauce will really pop, so have the other supplies ready to go because you can’t really take the time to open them up. You’ll likely have a bit of a mess on your hands if you do. As soon as it starts to boil stir in the entire box of Jello. Once that is all mixed in you can add in the cups of pop. Another word of advice. Pour the pop in slowly! 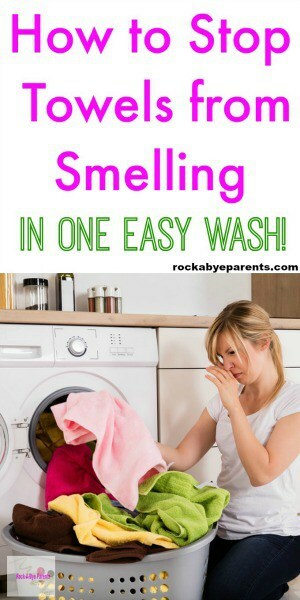 It will bubble up as you add it, but it will quickly settle down. If you pour little bits at a time you’ll be fine, but if you pour a lot of it in quickly it will bubble over. After you’ve added all of the pop you’re pretty much done. All you have left to do is to pour the applesauce salad into whatever bowl you want to serve it in and then put it into the refrigerator for at least 5 hours. This allows it to firm up, although it doesn’t get firm the way Jell-O on its own does. Still it is very watery runny if you don’t give it enough time in the fridge. I often find that I have more applesauce salad than my Waterford Crystal bowl will hold, so I always pour the remaining salad into another smaller bowl. We usually keep that bowl worth at home to eat on our own. One of the things I love about this recipe is that you can easily change it up. We often change the recipe based on the holiday and who will be eating it. This is a high sugar recipe, but we have several diabetics in the family. 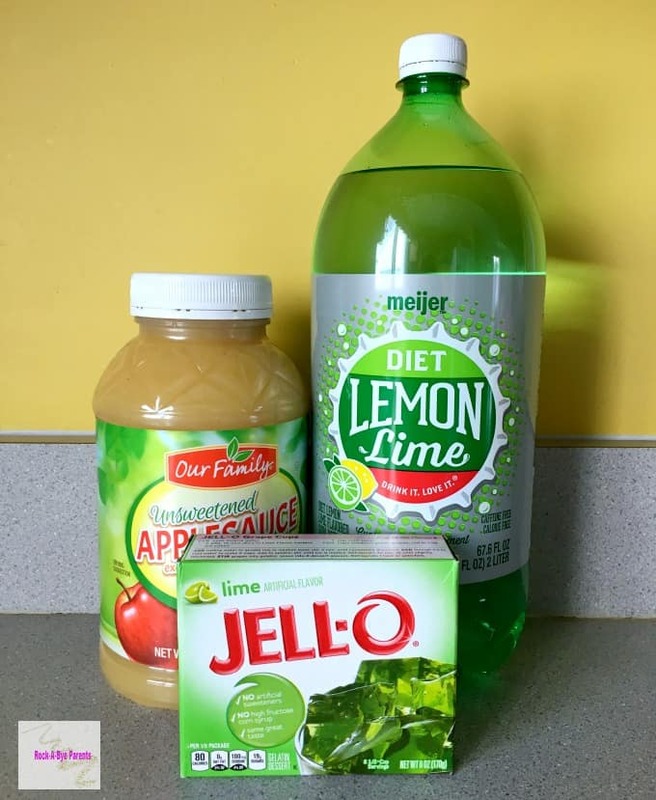 To make it more diabetic friendly we use unsweetened applesauce, sugar free Jell-O, and diet pop. You also can change the look and flavor of the recipe. Instead of green/lime you can give it an orange flavor by using an orange box of Jell-O and an orange flavored pop. You also can have a red/cherry flavor by using a box of cherry Jell-O and a cherry flavored red pop. This really is such a great recipe. 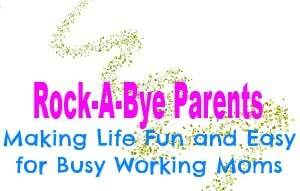 It’s so easy to make and it’s a big hit with the kids. I hope your family enjoys it as much as ours does! Heat applesauce on stove top until boiling. 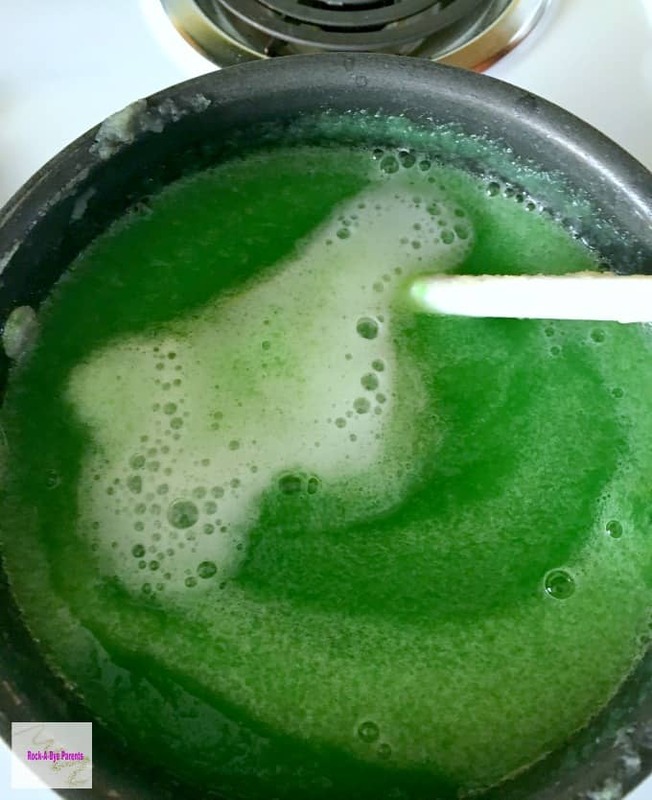 Once boiling stir in the box of Jello. SLOWLY add in the pop. The applesauce will bubble when you add the pop. If you pour it in all at once it will bubble over and you'll have a big mess. Pour into a large bowl and place in the fridge for at least 5 hours. 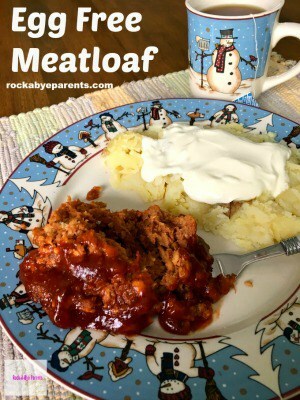 It doesn’t sounds like anything I would eat – but I’ll have to make it for my kids sometime!! I would totally try that and I’d use sugar-free Jell-O so I wouldn’t feel too guilty about it! This sounds like a fun food for kids! Interesting. What a fun food for a kid party. Interesting. I bet my son would love this! I’ve never heard of it – that looks interesting! It’s a Jello-Salad! 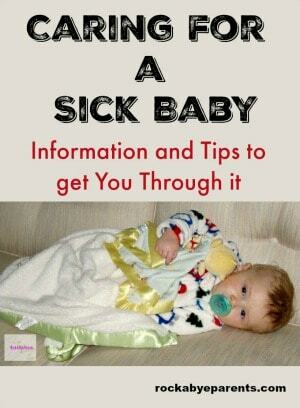 i think I’ve had this, too! Wow, what a interesting recipe. I’d try it! This would be awesome party food as well!! I am intrigued. 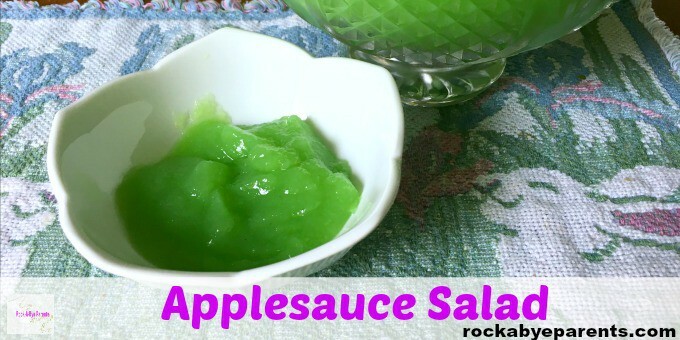 We are not huge applesauce fans but with the added jello I will admit it sounds pretty tasty. That could be a fun idea. 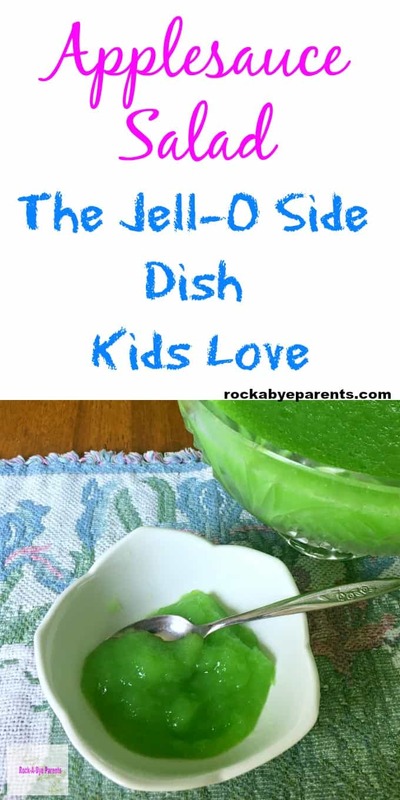 I’m not crazy about apple sauce or jello so I’ll pass but my kids would probably love it. oh my kids would love this!